CWA invites you to enjoy your art class among the rolling hills of Beautiful Concord. We strive to provide our students some of the best workshops with the top professional artists of our time. Please join in the fun. We look forward to meeting you. Discounts for CWA Members: To receive the Member discount, you must log in, choose Workshops, then click the blue Sign Up Now button. If you are not a CWA member, you may click the Sign Up Now button at any time. Pay by check: Alternatively, you may print out the Registration Form, fill it out and mail it with your check to the name and address printed on the form. Terms and Conditions and Cancellation Policy: Registering for a workshop means you are accepting our terms and conditions and cancellation policy. For more information, contact your Workshop Team using the contact page. 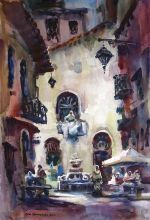 Join us as award-winning artist, Soon Young Warren, share her process in creating breath-taking brilliance in her master piece paintings. 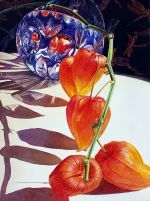 In this workshop, you will learn how to use glazing and washing techniques to create luminous, brilliant colors of crystal and red silk background in your paintings. Students will also learn how to apply masking fluid to preserve the white of the paper for highlights. You will have a "hands-on" painting experience while learning the concept of color theory and relationships as well as layering, washing, glazing colors, and detailing to finalize the painting. Soon will provide students with one-on-one guidance as well as helpful critiques all throughout the workshop. Be ready to get wowed!